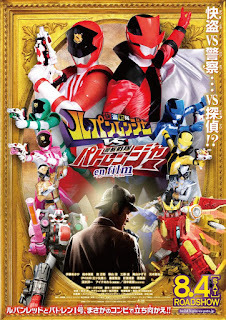 The official website for Lupinranger ves Patranger En Film has released the poster and trailer! In this film the rangers meet the famous detective Herlock Sholmes, played by actor Naoki tanaka. Kairi and Keiichiro also seem to have been taken to the Ganglers's dimension, where they have no choice but to work together to survive. Will this lead to the revelation of the Lupinrangers' identities to the Patrangers? Also, see Lupin X/Patren X in action! Lupinranger vs Patranger En Film will be released in August.